Story by Milli Thornton. 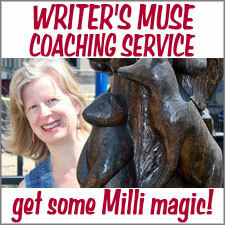 Photos Copyright © Milli Thornton & Jacquie Black. SPRING IS TRYING to sprung around here, so I decided to do an “auspicious good fortune” (as they say in feng shui) abundance-of-nature story to bring good luck and speedy improvement. 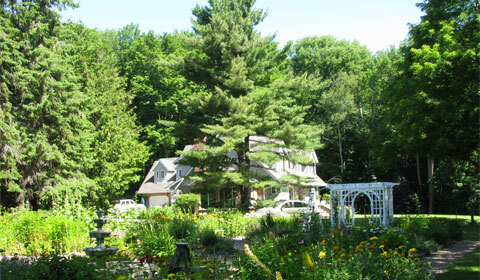 The garden at Beacon Shore on Georgian Bay B&B in Midland, Ontario was an obvious choice. Bob and I have more snow to deal with this year, and although the melt is slower compared to last year, we are optimistic about warm weather’s arrival. Our most accurate barometer and weather predictor, Molly, is providing all kinds of positive signs: racing across the lawn, investigating the abundant mole trails, climbing trees (not too high yet, got to get those flabby winter muscles accustomed . . . ), and begging for increasing hours outdoors. I know you’re wondering who the adroit Molly is. Here she is (below) peeking at Jacquie from the edge of the B&B’s private dock on Georgian Bay. The Blacks are avid kayakers, and here, Jacquie—who wins blue ribbons for her photography—is photographing Molly from her kayak. 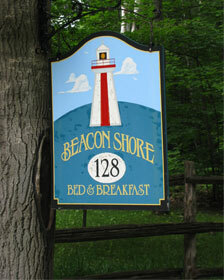 The B&B is named Beacon Shore because (a) it’s a short stroll from the shore, and (b) there’s on old lighthouse on the property. The lighthouse is a small, officially-preserved structure located on the lawn beneath the terrace of land where the garden and house sit. 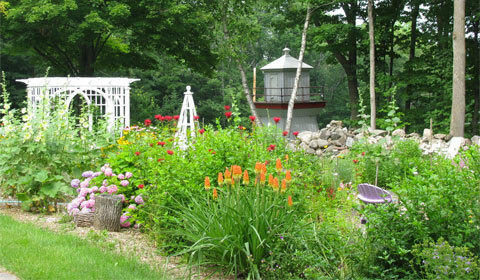 You can see the top of it in the photo below, along with an obelisk and trellised garden benches hand-built by Bob. One of my regrets from this trip (all good regrets) was that we were so busy doing interesting activities I didn’t have much time left to linger in the garden. I would have enjoyed sitting still for a while, listening to the fountain and the birds singing. There’s no traffic noise in the garden at Beacon Shore, except the distant sound of motor boats . . . and the silent sound of sailboats slipping by out on the bay. To give you an idea of how the entire property is embraced by fragrant woodlands, here’s a view of the house from the garden. Another of the visual delights that greets you as you arrive: the front porch. 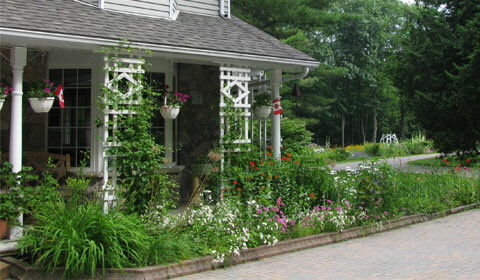 Jacquie has extended her cottage garden skills from the garden right up to the front door of the house. Below the house and garden is a lush lawn where you can sit in colorful Muskoka chairs to watch the boat traffic on the bay. At least, if you listen to Bob you’ll call them Muskoka chairs. 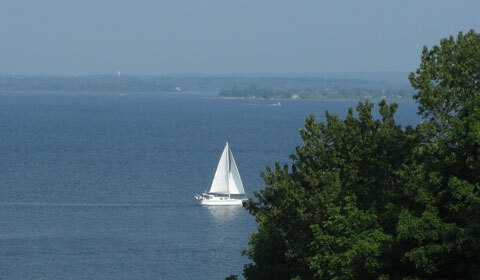 Bob grew up in Windsor, Ontario, associating the terms Georgian Bay and Muskoka with “cottage country.” If you listen to Jacquie, who was born in Quebec City, you’ll know to say Adirondack. “My summers growing up were spent at my grandmother’s in Saranac Lake, NY, in the Adirondacks,” she told me. 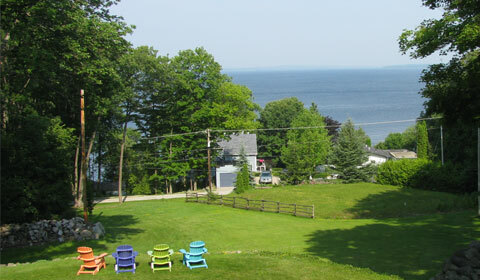 View of Georgian Bay from the front lawn. Be careful what you call those chairs! Eating breakfast on the front patio, or lounging in the lawn chairs, there are boats of many shapes and sizes passing at any given moment. Being up on a hill at the B&B affords a great view of the water traffic. Sailboats were my favorite; speed boats were Brian’s. 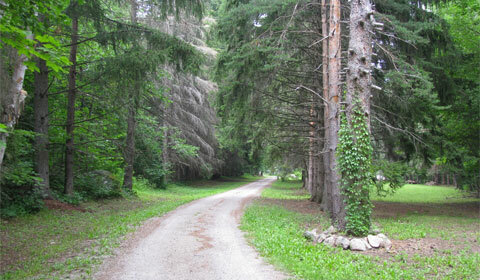 The first thing you see when you arrive at Beacon Shore is this deliciously spooky-looking gravel road leading into the woods. After a long drive from Youngstown, Ohio in crazy 4th of July weekend traffic, this road drove my romantic expectations to new heights. And I wasn’t disappointed. As we drove slowly down the lane, I felt engulfed by the peacefulness of the forest. And then we saw the garden! You know those experiences where you pick something from the Internet that looked better online than it does for real? Well, Beacon Shore looked wonderful on the Web . . . but truly magical once we got there. And the feeling of coziness + adventure as we turned down this road is one of my treasured travel memories. Like entering Berenstein Bear territory . . . what's down this mysterious road? Whenever we returned home from an activity, we were always glad to spot the sign to the entrance. The property is so inconspicuous and well-hidden from the street, you would otherwise never know a B&B was tucked away down that gravel road. Much less that the road would open out to such magnificence and charm. It’s a good thing she’s there to nudge Bob and Jacquie regarding when to come out of hibernation. . . .
What a lovely Spring article Milli! 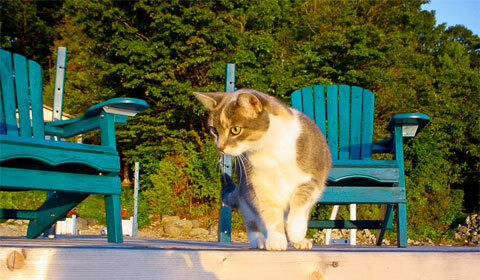 I just loved all the pictures, especially Molly and those four different colored Muskoka – Adirondack chairs! The whole place is gorgeous looking in the pictures too! It looks like Jacquie & Bob have carved a wonderful niche in their world to provide a haven for travelers. You certainly piqued my interest the way you write about it from your personal experience. “I would have enjoyed sitting still for a while, listening to the fountain and the birds singing.” Oh how many times I said something like that after coming back from a busy, rush-about vacation. But it looks like you took the essence away with you anyway, when you returned home. Your memories are striking. I loved your description of entering the gravel road after a long drive in 4th of July traffic. What a picturesque scene you evoke. The photo of that road is inviting. Jacquie & Bob should be brimming with guests all the time having such a pastoral setting, views of the water and Molly to greet you! They sound like the perfect B&B owners you want to visit. Thank you for reading so attentively. You picked up on the nuances, which is partly what (for me) Beacon Shore is all about. What a delightful feeling it is to experience our B&B through another’s eyes! Your expressed appreciation of the garden and its ambiance is in large part what guides us through the necessary chores in preparation for its charms — the plants, flowers and the visiting wildlife. 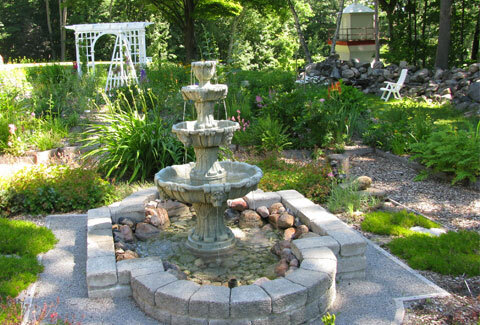 And yes, we truly look forward to your return visit to absorb the essence of the garden near the fountain, with Molly nearby, alert for the possibility of a scurrying bug, slid comfortably back in colorful Adiron– (oops!) Muskoka chairs. I’m glad I could give you the experience of seeing your B&B through the eyes of one of your guests. Too bad you can’t clone yourselves and then book in as guests for a long weekend. To be on the receiving end of the beauty and pampering of Beacon Shore is such a gift. What an amazing and relaxing place — I would love to sit in one of those Adirondack chairs! A vacation is not in my immediate future, so I especially enjoy reading about such lovely places that I can dream of one day visiting! Thank you! Glad you enjoyed it and that I could give you something to dream of. 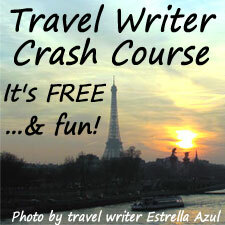 As a travel writer, that was music to my ears! Lois, I know you would LOVE Beacon Shore. I hope you get to have a vacation this year.